These words are used by two different characters in the beginning of Joel and Ethan Coen’s latest film just before a gun goes off. 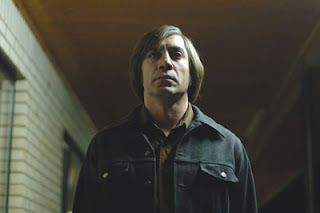 The first speaker is sociopath Anton Chigurh — a man for whom the term hit-man may be a gross understatement — who utilizes this request just before he dispatches his second of many victims that follow with a livestock air stun gun to the brain. The second character is cowboy Llewelyn Moss who makes the foolish mistake of greed, vanity and arrogant pride when he takes off with a satchel filled with two million dollars after he tracks an animal while hunting and stumbles upon the brutal remnants of a drug deal gone horribly wrong with most of the participants bathing in blood and west Texas sunlight. Taking its title from W. B. Yeats’ poem “Sailing to Byzantium,” No Country for Old Men is based on Cormac McCarthy’s 2005 novel and although its old men whose values of past and melancholy remembrance of a time when sheriffs didn’t need to carry a gun is put to the test at the forefront, they’re just one of the victimized groups in the movie alongside the younger men, women and animals executed in the bloody two hours. Relying on his natural persona, Tommy Lee Jones settles instinctively into his role and even without his folk wisdom filled voice over and Texas vernacular that opens the film, he’s a man who believably exudes the law and seems like the ideal choice. Jones’s lawman asks questions first and prefers to shoot later, letting younger officer Wendell go through the door of a trailer first with his gun drawn, and later making the impulsive decision to drink milk left by perpetrator Anton left on the coffee table instead of locking down the crime scene or dusting for prints in a theatrical Dragnet style. Bardem, given a purposely horrid haircut discovered by the brothers in an 1890’s photo of a brothel patron, is referred to as a ghost in the film and some of his scenes are setup painstakingly similar to the finale of Blood Simple. Although, after making films for more than two decades in a world that’s getting increasingly unpredictable, we’re never sure just what the Coens will have happen until a surprising finale left some critics angered by its anti-climactic out-of-the-blue quality that would surely have earned the screenplay an "F" in most college writing courses. I was prepared not for the exact details of the ending but the fact that it stunned others and while admittedly I was a bit dismayed at first, later I realized that it still seems to fit with the man vs. man mentality of the piece and the unpredictability of life itself that's a recurring Coen theme. Life is a coin toss after all and the fact that there's no overt payoff corresponds to the rules of the darkly existential, old testament style game being played. To quote one of the more memorable titles in Elmore Leonard’s crime novel oeuvre, No Country for Old Men is “freaky deaky” indeed — alternatively pulsating between moody contemplation and tense action perfectly depicted by one of our most gifted cinematographers, the incomparable Roger Deakins. Nominated for the ’07 Golden Palm at the Cannes Film Festival, not only is this vicious masterpiece sure to be one of the most discussed films when looking back at the very best of the Coen films but it’s also one of the best movies of 2007.